If you haven’t already, it’s time to spice up your wardrobe with some new spring knitting patterns. Knitting isn’t just for the colder months - there are plenty of lightweight patterns available that make great accessories for spring. Though spring is the herald of warmer weather and blue skies, it has its fair share of rainy days and chilly nights. April showers bring May flowers; with these picture perfect knitting patterns you will be able to enjoy every moment this spring, no matter what the weather looks like. In this eBook, you'll find everything you need to turn your spring into a fun and colorful knitting extravaganza. You are sure to enjoy spring so much more with a gorgeous project on the needles that you can look forward to showing off at Easter. With the bitter cold of the winter months well in the past, your spring knitting can focus on light and lacy patterns. Shawls and light cardigans are knitter favorites for spring, when you can wear them in place of a light jacket. Your hand knits will ward off any stray chills and are sure to look fantastic. The 9 Free Knitting Patterns Perfect for Spring eBook not only includes free shawl knitting patterns, but you'll also find lacy scarves, handy market bags and totes and even a light blue cardigan that's great for covering up on breezy evenings. You'll find plenty of knitting patterns for both casual and fancy occasions, and what better way to support the green movement than by making your own grocery bag to use at the store. The change to lightweight patterns is a great opportunity to try out a simple lace pattern. You can also try experimenting with lighter yarn. Bulky yarns are fun to work with, but are much to heavy for the warmer weather of spring. Lighter yarns have their own strengths, and create projects that have marvelous definition and intricate stitches. Once you’ve finished knitting your favorites from this beautiful collection of spring patterns, you’ll be more than ready to take on the new season in style! Download the 9 Free Knitting Patterns Perfect for Spring eBook now! Shawls are a spring favorite for knitters. You can wrap these stylish confections of yarn around your shoulder for a little additional warmth. For those slightly chilly spring days, a hand knit shawl is the way to go. Bulk up those lace skills by knitting up one of the lovely shawl patterns in 9 Free Knitting Patterns Perfect for Spring. You will absolutely love the end result; shawls are quite enjoyable to both knit and wear. With patterns like the Emily's Circular Lace Shawl (page 5), you will find yourself wanting to knit a storm of shawls. The Emily's Circular Lace Shawl is a quintessential summer shawl; it is delicate enough to be worn out for dressy events, but can easily be dressed down with jeans. Even though this pattern requires four charts to complete, the end result is far worth the effort. Knit scarves are another great accessory for the spring weather. The right scarf can complete an outfit and provide you with some additional warmth. On days where a brisk spring breeze is blowing, a scarf can make the day perfectly enjoyable. Since knit scarves for spring tend to be lighter, these patterns tend to be more playful with more lacy details and decorative elements. A knit scarf will always provide some warmth, but these lightweight scarves are certainly suited to the varying weather of spring. 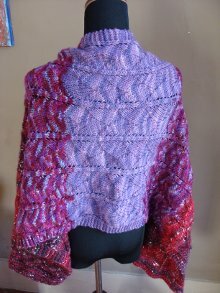 The Dragon Skin Wrap or Scarf (page 10) is one of the most versatile patterns in this eBook. If you're looking for a shawl that breaks the boundaries of traditional, this is the wrap for you. Whether you decide to make this pattern into a scarf or a shawl, the dragon skin stitch creates an intriguing design that's both feminine and full of attitude. Just looking at this pattern gives you an idea of how spring scarves differ from their winter cousins; these patterns are less focused on warmth and more interested in creating a visually appealing accessory. Spring is always met with enthusiasm because it marks the re-awakening of the earth; farmers emerge alongside flower buds to start working the earth again. Local farmers markets open up in late spring to offer early vegetables and flowers. One of the best ways to show your support for the earth is to dispense with plastic bags and start using reusable, cloth bags. Knitters are well situated to dispense with the plastic since they can put their skills to use to create a handy tote from yarn. Even if you don’t plan on going to the farmer’s market, you can still use the tote bag patterns in 9 Free Knitting Patterns Perfect For Spring at your regular grocery store, as a work bag or lunch box, or to carry your books in. 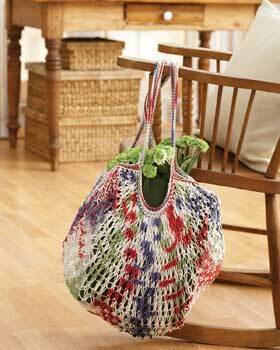 The Rainbow Market Bag (page 19) is a wonderful pattern that will faithfully travel around the globe with you. Go green in style with this colorful market bag. Leave the paper and plastic bags at home and instead tote around fresh fruit and veggies or whatever you can fit inside with this simple bag. Why not make a few more for your friends to enjoy! Even if you have plenty of projects already on your knit list for spring, you don't want to miss out on this amazing collection. Make a beautiful felted floral bag for a friend or knit a simple, lacy scarf to add some color to an otherwise plain ensemble. Since you can download this eBook for free, there really isn't anything to lose! Download your free copy now and start creating gorgeous knits for spring. With our latest eBook, 9 Free Knitting Patterns Perfect for Spring, you'll find yourself knitting any number of lovely, lightweight patterns. And once you subscribe to receive our newsletter, Knit Picky Patterns, you'll see how incredibly rewarding it is to be a part of the knitting community! Check out this free eBook and the AllFreeKnitting.com site to get tons of knitting inspiration, tips, tutorials, and more! This is another great ebook. I love down loading them to my iPad and then I can delete the ones I don't want to make. It saves paper and I can have directions with me at any time. I saw three I want to make for sure. Thank you for sharing. For a free book there are some stunning patterns in here, I have started Emily's Circular Lace shawl and have to admit that it is not for the novie or faint hearted, it is a difficult pattern but the instructions are well written and I have completed the first section of diamonds with only one mistake that I have to go back and fix. The charts are helpful and although it is going to take a long time the section I have completed is worth it. I plan on also making the felted bag as I love the look of the flowers and love making and collecting bags. Thank you for another great free resource, just what I needed to start planning for the summer during the post Christmas lull. The shawl is my favorite of all the patterns in this eBook. I enjoy spring but most evenings are chilly. I like the idea of shawl that can be put on or taken off easily as the temperature changes. Has anyone who has tried this pattern tell me if it is as complicated as it looks? I plan on knitting that large tote bag out of Lily Sugar and Cream yarn. With Spring on its way, it means its Yard Sale season, and I love having a big tote to carry all my treasures. The cotton yarn will make it sturdy and washable. This is just the information I am finding everywhere.Me and my VW Scirocco friend were arguing about an issue similar to this! Now I know that I was right.Thanks peugeot cars for the information you post. I just subscribe your blog. This is a nice blog. I agree with dwsokay. The shawls are gorgeous but my eye is on the cardi. Spring Knitting eBook is very nice. Many things that caught my eye. I'll be doing the cardigan for sure.